Rescuing and nurturing abandoned or hurt animals is nothing new to Joe Michalik, a volunteer at the Indiana Welcome Center. On Friday, Aug. 22, Michalik and a group of visitors watched as the four 8-week-old Mallards Michalik and his son rescued were released into Optimist Lake, located behind the welcome center. "They belong in Mother Nature," said Michalik. Michalik and his son, Joseph Michalik Jr., were working at the Indiana Welcome Center on June 13, 2014, when they were notified that there was a wounded duck nearby. "My son and I went to look for the wounded duck, and it was already in the parking lot next door," explained Michalik. "She had a broken foot and she ended up flying into the Little Calumet River. I told my son that there&apos;s got to be a nest around." Knowing the mother wasn&apos;t going to return to her nest wounded, Michalik and his son found the nest, abandoned with unhatched eggs. "There were ten eggs, but some of them were destroyed. We took the others and brought them inside and started warming them back up," said Michalik. "The eggs were cold, but I told my son we needed to give it a shot." After leaving the welcome center, Michalik and his son took the eggs home and made a heated incubator. Michalik&apos;s son turned the eggs four times each day until they began hatching ten days later. "My son said to me one day, ‘dad, I think they&apos;re hatching.&apos; We checked and the egg was breaking. Then we heard a ‘peep, peep, peep,&apos;" said Michalik. According to Michalik, it took the ducklings eight hours to fully hatch. "After they hatched and dried off, we went to a feed store and bought baby duck food. Once the ducks knew the food and water was there, they did everything on their own," he said. Michalik also built an outdoor sheltered pin for the ducks while he waited to return them to the lake. 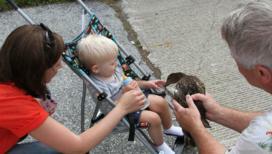 This was not the first instance Michalik rescued abandoned ducks at the Indiana Welcome Center. "Six years ago, ten baby ducks were found without a mother at the Indiana Welcome Center," he said. "I can&apos;t just leave something on its own without helping." Michalik took those ducklings home to allow them a chance to grow safely before releasing them back into Optimist Lake. Additionally, Michalik and his son have raised raccoons, other birds and ducks, and baby squirrels that had fallen from a tree during a storm. The Michaliks nurture the animals before releasing them back into nature. "I hope the ducks start their own families in a couple years and keep coming back (to Optimist Lake)," said Michalik. "We keep destroying the wetlands, I figure, sometimes man has to help Mother Nature along." Oliver with duck: Michalik shows Oliver Gladstone, son of Nicki Mackowski-Gladstone, South Shore CVA Vice President and Chief Communications Officer, one of the rescued ducks before it is released into Optimist Lake.